Now that the cold weather is truly upon us, I often have a craving for something hot and soupy. And if you want to connect with family and friends rather than hibernating for winter, there is no better meal to have than a Chinese steamboat experience. It ticks all the boxes really. 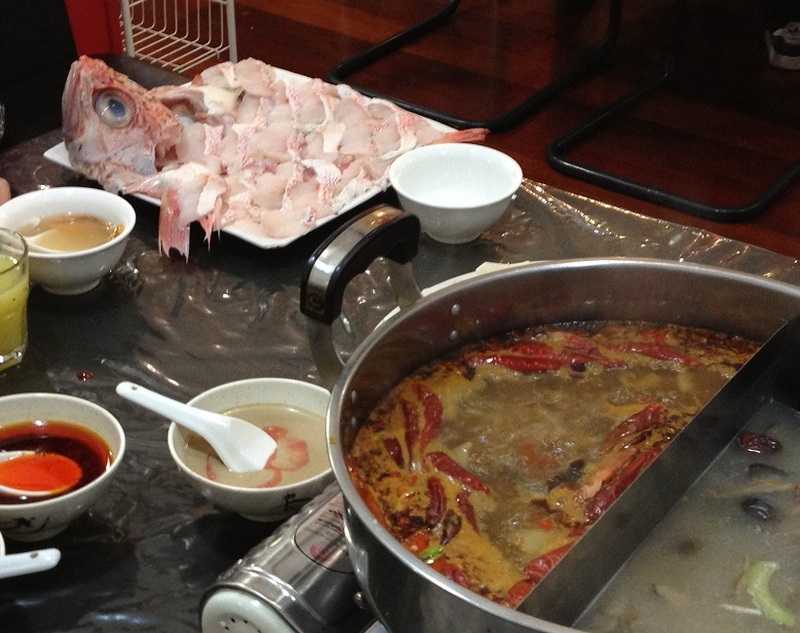 Also known as a hot pot, a steamboat meal starts with a large simmering pot of stock in the middle of the table, and you cook your food in it yourselves. You are allowed to be loud and raucous, the young ones can play with their food, the grandparents can warm their achy bones and boil their portions to mush so they don't need to chew, and everyone gets to pick and choose, not only what they put into the soup base for cooking, but also how long it is cooked for, and with what sauces it is flavoured afterwards. It is conducive to conversation, because everyone is interacting constantly, with food arriving at the table, being dropped into the pot, and being scooped out again, being passed around, dipped in sauce, eaten. You can revel in a hive of activity. There are plenty of steamboat restaurants in Auckland, but the one we have been going to is Golden Steamboat, upstairs in the middle of that strip of restaurants on Dominion Road in Balmoral. You want to go with a group of people, because that all-important pot of stock is going to set you back about $20 already. After that, though, it is all too easy to keep adding to your order, with a plate of meat balls for $4, meat slices for $6 - $8, vegetables for around $3, herbs and bowls of dipping sauces for $1 or $2, and cooked food like fried dumplings for $7. There are a good number of soup bases to choose from, and you can also have half-and-half, which we like to do, to cater for spice lovers and heat-avoiders alike, or meat-eaters and vegetarians, as the situation arises. The vegetarian mushroom soup base seems to hold a special status. If you order this for your stockpot, a staff member will ladle out a bowl for each person at the table as an appetiser. And it makes sense too, to savour these beautiful fresh mushrooms before their delicate flavour is submerged in everything else you throw into the pot. Mushroom soup base, served before the stock is polluted with other food. Then the frenzy begins! One by one, your orders come out, until there is no space left at the table. The staff will refill your pot when the liquid begins to run low, but otherwise, you are now in charge of your own dinner. Prawn paste and beef slices, on the side as there was no room on the main table. Fresh whole fish, and various sauces. I like to drink the soup from the pot, but if you are still thirsty, there is not only Chinese beer and wine available, but also a wide variety of fresh juices (diluted with water, the way I like it). For $5 - $8, you can have not just a glass, but a whole jug! Kiwifruit, grapefruit and pomegranate juices. 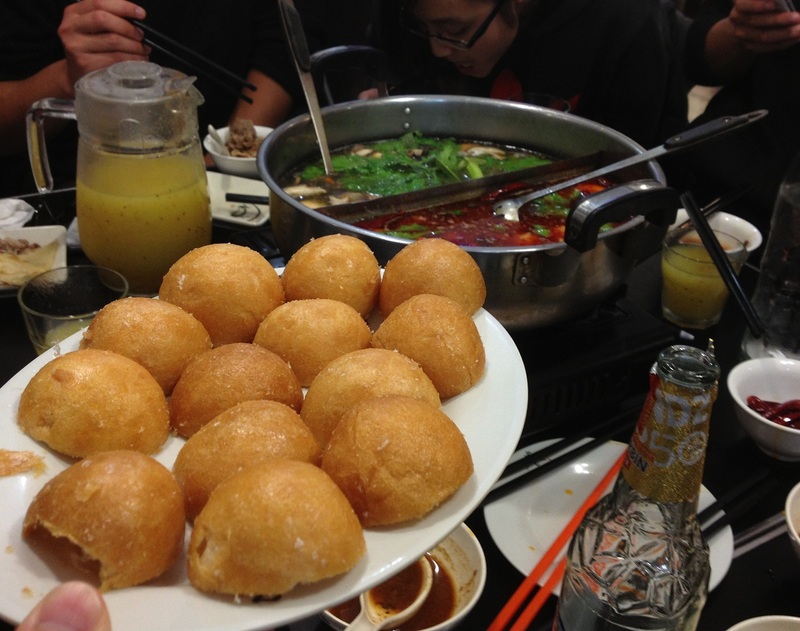 The food at Golden Steamboat is fresh and varied, and it's great fun to have a hands-on dining experience. With nearly everything simply simmered, it is both healthy and very reasonably priced, and your meal is never cold! The important thing here is variety. 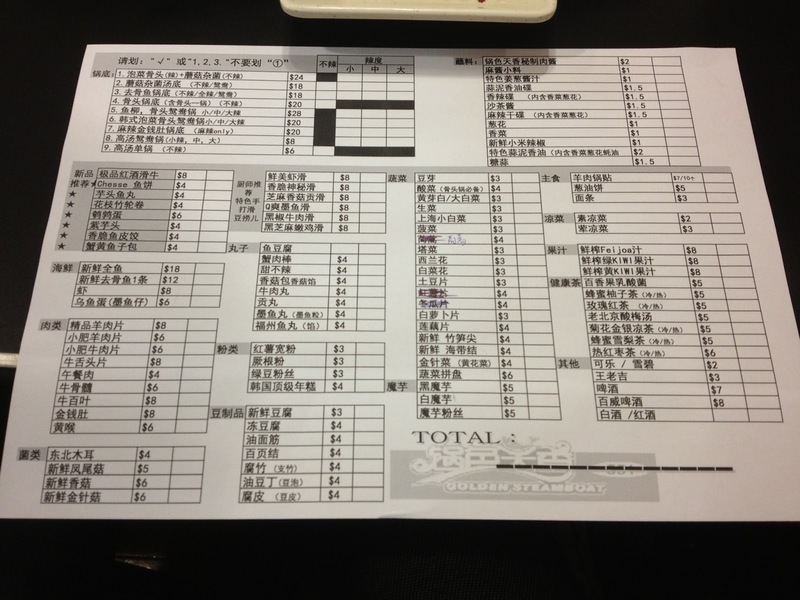 Don't get three different types of meat balls; try to order something from each section. The exception is the vermicelli. You will probably be too full to eat any starch, and you can always order the noodles afterwards if you find you are still hungry. Who would have thought you can safely share a meal with friends without ordering something just for yourself? Here, you can have half a pot of the mushroom soup base, and cook in it any number of things, including six different types of tofu, four varieties of mushroom, and an assortment of Chinese vegies, from lotus root to tong ho (if you have not had garland chrysanthemum before, be aware it has a pungent flavour). 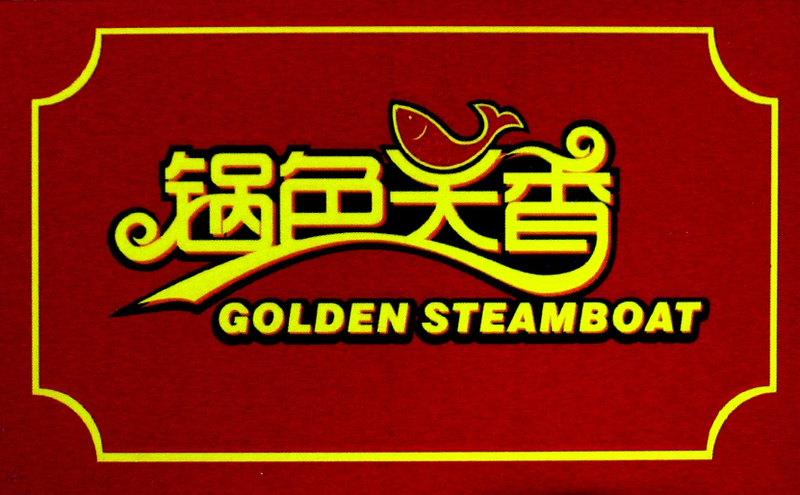 Warning: Do not eat the Golden Steamboat Special Sauce—it has meat in it. And the mushroom dumplings in the meatballs section is there for a reason—it is basically a fish ball with a mushroom filling.